Properties in Dunfanaghy Stables average 4.6 out of 5 stars. Luxurious Waterfront Holiday Homes with Private Pebble Beach & Free WiFi. Property 4: Luxurious Waterfront Holiday Homes with Private Pebble Beach & Free WiFi. Peaceful location,Superb sea views,on the 'Wild Atlantic Way'! ...With internet. Property 5: Peaceful location,Superb sea views,on the 'Wild Atlantic Way'! ...With internet. There were three of us on holiday in this quaint and comfortable cottage. We absolutely adored our accommotions and Maxine was right there to greet us with firewood and a warm welcome. The unadvertised extra half bath was a welcome surprise too. Would stay here again in a heartbeat! Highly recommends nd! We loved every minute in Ardroe Cottage. 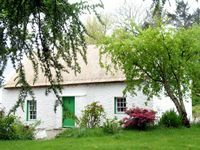 Michael and Margaret have created a wonderful atmosphere in this perfect thatched cottage. There are antiques to remind us of a time gone by. Having grown up in the cottage Michael is lovingly sharing the opportunity to others to live, at lease for a short time, in a place that is oozing with history. As we sat in front of the amazing peat fire we could imagine the cottage being filled with children's voices and families coming together. They provided us with kitchen staples, lovely Christmas cakes and lights and a lovely nativity which made our Christmas stay perfect. There is a lot to do and see in the area. The people living near are very friendly and helpful. We highly recommend the cottage!